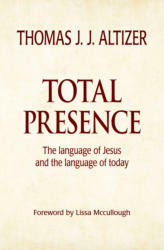 Title: Total Presence: The language of Jesus and the language of today Author: Thomas J. J. Altizer Imprint: Noesis Press/The Davies Group, Publishers soft cover 240 pp. USD 16.00 ISBN 978-1888570569 2016 Total Presence is a miniature theology of history, whose revealing chapter titles—The Parabolic Jesus, The Anonymity of God, The Kingdom of God, History and Eschatology, Praxis and Apocalypse, and The Solitude of the End (which concludes with a section on absolute solitude)— attempts to at least partially comprehend the Bible, the Classical world, modernity, and Buddhism. It is limited to the high points of these worlds. Altizer is often asked if one is to read only one book of his which one should it be and he is now tempted to answer, Total Presence. He feels this may well be his best book, “surely my best presentation of Jesus and the Kingdom of God, and it also embraces a larger arena than any of my other books . . . .” This small book contains a full systematic theology, covering all of the points that are fundamental in his theology. Contents Foreword by Lissa McCullough Chapter One The Parabolic Jesus The Theological Problem of Speech Self-embodiment and Eschatological Speech The Pretextual Identity of Speech Chapter Two The Anonymity of God The Anonymity of Selfhood The Mystery and Unknowability of God A New Anonymity Chapter Three The Kingdom of God The Historical Confrontation of Opposites The Mystery of the Kingdom of God The Kingdom of God Beyond God Chapter Four History and Eschatology The Apocalyptic Ground of Modern Revolution Revelation and Revolution Cultural and Political Revolution Chapter Five Praxis and Apocalypse The Final Presence of History The Language of Praxis The Identity of Praxis Chapter Six The Solitude of the End The Time of the End The Way of the End Absolute Solitude Index Author Thomas J.J. Altizer is Professor Emeritus of Religious Studies at the State University of New York at Stony Brook. He is one of the most distinctive and creative theological thinkers, and foremost exponent of radical theology of the twentieth century. He is the author of many books, among which can be numbered Radical Theology and the Death of God, co-authored with William Hamilton; The New Gospel of Christian Atheism; The New Apocalypse: The Radical Christian Vision of William Blake; Genesis and Apocalypse; A Theological Voyage Toward Authentic Christianity; and Living the Death of God: A Theological Memoir.